The Stamp Man: More new products!! I got back last night after a fabulous time at the trade show at the NEC and I wanted to share details of a couple of the new products that I fell in love with, I have tested them both out and I can highly recommend adding them to your craft stash. I took over a hundred photos at the show, including freshly made inspiration from Fran from Stampendous, Lynell from Dreamweaver stencils, Jane and Francoise from Woodware Craft Collection too so I will share those with you another time. I was working on the Woodware stand and was thrilled to be able to demonstrate the new Brilliant Bowmaker there. Fran was 'playing' with the Creative Palette and I loved what she created with it. I have added the product descriptions below but will add more info another time. 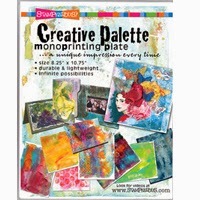 The Creative Palette is a monoprinting plate that will allow you to create an infinite variety of backgrounds and textures for your mixed media canvases, art journals, scrapbook pages, cards, home decor and other projects. An indispensable tool, it allows you to use acrylic paints, inks, and other mediums together with stamps, textures and tools to create a Stampendous Impression every time. Don't miss the Stampendous series of YouTube videos on this terrific product. Palette is A4 (measures 210 X 293cm) and comes in a snap tight storage case allowing it to be stored in any position. Durable and versatile. Easy Clean Up! Instructions, tips and ideas included. Our brand new package geared towards scrap bookers and card makers! 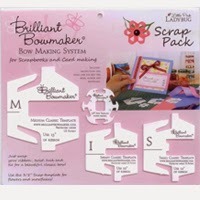 This set contains our four smallest templates - the Medium, Small and Infant classic style for traditional loop bows as well as the 3/8" Snap template for flowers, snowflakes and butterflies. These come with a full colour card that explains the self tied method of construction for the Classic bows and detailed photos for the Snap template as well. If you are a visual learner, just scan the code on the back of the card to have our video guide you through the process. I had added more new products before and I know I still have more to add... I love this time of year!!! Hi, nice to see that there are other brands of mono printing plates available !